76% of Suppliers Do Not Understand the Code - Do you? 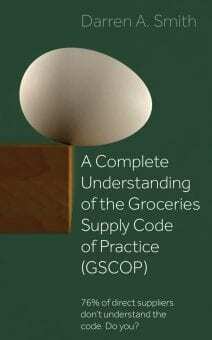 This GSCOP Quiz is designed to test how well you know ‘GSCOP’ – The ‘Groceries Supply Code of Practice’. The law that governs how major UK Supermarket treat their Suppliers. We hope you will find the Quiz a useful tool in deciding whether your team need to read the GSCOP book. #1 Which Supermarkets are affected by GSCOP? All supermarkets in the UK. Every supermarket with over 1,000 stores in the UK. Every major supermarket with sales in the UK of over £1bn per year. At present this is 12 supermarkets; Asda, Aldi, Lidl, Co-op, M&S, Tesco, JS, Morrisons, Waitrose, Iceland, Ocado and B&M Home Stores. #2 What does GSCOP stand for? Groceries Supply Code of Practice. Grocery Sales Code of Practice. ‘Groceries Supply Code of Practice’. Introduced in 2010 as part of the Order – ‘The Groceries (Supply Chain Practices) Market Investigation Order’, of which the Groceries Supply Code of Practice (GSCOP), was a part. #3 Do major supermarket buyers need to be trained in GSCOP by law? Depends on where they work and for how long. Yes. By law, as part of GSCOP, supermarket buyers in the named supermarkets, must be trained in GSCOP. #4 Can a major supermarket ask a supplier for loss of profit monies for not achieving their target service level? Yes, if it is in the written supply agreement. Depends if the supplier has signed-up to GSCOP. Yes, if it is written into the supply agreement. A case study by the GCA with Co-op said that the practice of charging suppliers loss of profit was not consistent with GSCOP and Co-op stopped it immediately, unless it is written into the supply agreement. #5 What is the Groceries Code Adjudicator? Someone appointed by the supermarkets to manage supplier relations. Someone that fines supermarkets if they contravene GSCOP. Someone that will be appointed by the Government soon to help suppliers. Someone that fines supermarkets if they contravene GSCOP. One of the powers of Christine Tacon, the Groceries Code Adjudicator, is to fine a supermarket up to 1% of their UK sales. For Tesco this is up to £500m. No fines have been made yet. #6 How much can suppliers claim back from supermarkets for poor forecasting from supermarkets, according to GSCOP? 1% for each sku that was under/over forecasted. Depends on what is written in the supply agreement. Depends on what is written in the supply agreement. The supplier can be compensated for the supermarket’s forecasting errors, except as expressly stated in the supply agreement, or where the supermarket acted with due care and good faith. #7 Which of these categories is not covered by GSCOP? #8 Which of these can Supermarkets not include in any supply agreement? They must not request or require any payment for shrinkage. They must not require any payment for wastage unless as stated in the supply agreement. #9 How much notice must supermarkets give for a delist? Reasonable notice must be given to the supplier of a proposed delist, in addition genuine commercial reasons must be provided and the supplier has the right for the decision to be reviewed by the supermarkets Code Compliance Officer. #10 When is a supply agreement written and by who? A written Supply Agreement must be provided by the supermarket to the supplier when goods are supplied. The written supply agreement must incorporate the requirements of the groceries code. In this book you can significantly raise your awareness of GSCOP – Buy the GSCOP Book for £9.95. Get a free copy of the book and discuss GSCOP with the Author in this GSCOP Masterclass. You can download the contents page or the free Chapter: A Potted History of the Bill, the Order and the Code. The GSCOP Aware Association has been formed with one mission – To be the mark for Suppliers to demonstrate that they are GSCOP Aware. Joining is based on passing an online assessment regarding GSCOP that we envisage two-thirds will fail. Increase trust with your supermarket buyer.